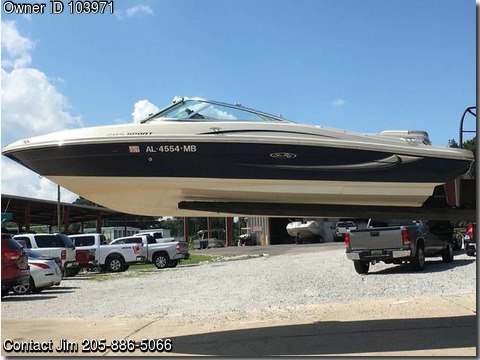 Boat is located in Tuscaloosa,Al.Please contact the owner @ 205-886-5066...Beautifully kept one owner 2010 21' Sea Ray Sport Boat. Only 162 hours on the 5.0 MPI engine with hydraulic steering and trim. Equipped with trim guage, depth, tach and speedometer and built in ice bin. Sony stereo/cd/mp3 system and 4 Sony speakers. No cuts, or tears on the vinyl seating and very clean. Carpet is snap in and is also very clean. Wide swim platform comes with ladder and SS ski rope post. Boat comes with swing away tandem trailer with spare tire, hydraulic brakes and boat guides for easy drive on. Comes with Bow cover, cockpit covers, full size Bimini top and full size boat cover. Ready to put in the water.